I need a little help with this movie review. You know what, buddy? Once you get older, some of the things that you love might not seem so special anymore. Like your Jack in the Box. Maybe you realize it's just a piece of tin and a stuffed animal and then you forget the few things you really love. And by the time you get to my age maybe it's only one or two things. With me I think it's one. I'm confused which "one" he is talking about. Is it his child or is it his job as an explosive ordnance disposal team leader, disarming explosive devices in Iraq? 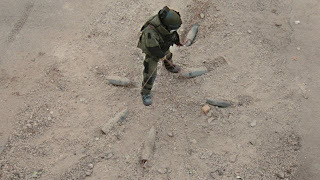 The Hurt Locker follows James as the new team leader of the EOD team during the Iraq war. The team also includes Sergeant J.T. Sanborn (Anthony Mackie) and Specialist Owen Eldridge (Brian Geraghty), whose jobs are to support their team leader in defusing the explosives and protect him from snipers and any suspicious elements that maybe hiding in Iraqi buildings. 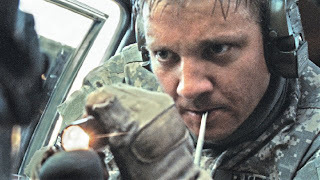 The Hurt Locker movie highlights the scenes we are seeing on CNN about cross-country wars. Who would want to play with bombs as a means of living? What does "the hurt locker" mean? At first, I thought "the hurt locker" refers to a person whose job is to save the people from getting hurt. As in "locking" the hurt so it won't get to others. But after some research, I found out that "the hurt locker" is a slang term for "being hurt in an explosion." It also means a place where someone is deemed to be hurt, like in a war. As in a "locker" or "shelf" full of hurt or pain. 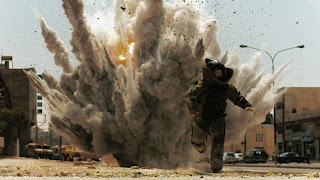 The term "hurt locker" in this movie describes the suffering a bomb disposal team undergoes. Not only physical pain but also social and emotional anguish. Being away from your family. Dealing with each other's differences. Trying to escape death. Who would play with bombs for a living? Again, back to the message Seargent James told his son. Is it his son the only thing he loves or is it his job? Seargent James is a reckless and courageous bomb disposal team leader. He unnecessarily throws tear gas to create a diversion. He would rather take off his bomb suit during a crucial mission because in this words "If I'm going to die, I'm going to die comfortable." This reckless has lead to a situation where Specialist Eldridge was shot in the foot. Why is Seargent James so reckless? While watching the movie, my question was, why is Seargent James this reckless? Doesn't he have anything to lose? Does he have a family or something? As it is revealed. He have a wife and a kid. They're divorced. But they're still living together. Looks like Seargent James don't care a lot what their relationship is. So maybe a dysfunctional family relationship made him so reckless. He's ready to risk his life because he has nothing to lose. No one would really care. But he does have something to lose. In the scene where an innocent man was strapped with a vest full of explosives, and Seargent James only got two minutes to save him, I learned he does have something to lose. The movie didn't tried to do the impossible. With a hair of a minute, Seargent James had to make an important decision, that of saving his own life. To answer my question, maybe the only thing he loves is not his son. Maybe it is not his job, too. The only he thing he loves is himself. Doing what he loves to do. The Hurt Locker is directed by Kathryn Bigelow and written by Mark Boal. It has received nine nominations in the 82nd Academy Awards (Oscars 2010), including the Best Picture, Best Director, Best Original Screenplay, and Best Actor awards. The Oscars 2010 will announce its winner on March 7, 2010. Update: The Hurt Locker won the Best Picture award in the recently concluded 82nd OSCARS Academy Awards. Kathryn Bigelow won the Best Director award. The movie also won the awards in Film Editing, Sound Editing, Sound Mixing, and Best Original Screenplay.